This species is widely distributed in tropical and subtropical waters, but is under threat everywhere from over-harvesting of both eggs and adults, and from accidental mortality in the nets and long-lines of fishing fleets. 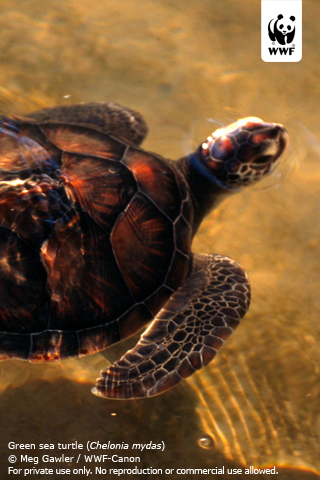 Green turtles are widely harvested for meat in many tropical countries. An estimated 100,000 are killed in the Indo-Australian archipelago each year. Equally as worrying are the high numbers, in some areas, of green turtles suffering from debilitating and potentially lethal tumours. The cause of these tumours is unknown but there is suspicion that increasing chemical pollution levels might make turtles more vulnerable. Green turtles have long played a significant, symbolic role in traditional Indonesian Hindu rituals and ceremonies. Green turtles are named after the greenish colour of their cartilage and the fat deposits around their internal organs, but are black-brown or greenish yellow in colour. The carapace is oval when viewed from above, and the head is relatively small and blunt. From 80 to 150cm in length and up to 130kg in weight. Dark black-brown or greenish yellow. There are important green turtle nesting and feeding grounds around the whole coast of Africa, India and South East Asia, along the entire tropical coastline of Australia and the South Pacific Islands. They are also found in the Mediterranean and occasionally as far north as the coastal waters of Great Britain. In the West Atlantic the range extends from Cape Cod through Central America as far south as southern Brazil. Populations in the Eastern Pacific stretch from northern USA to the southernmost record in northern Chile. 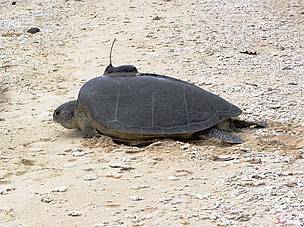 Nesting occurs widely throughout the range, even on the central Pacific islands, where few other species of nesting turtles now occur. Current estimates suggest the age of sexual maturity is 33 years. Females migrate huge distances between feeding grounds and nesting areas, but tend to follow coastlines rather than cross open water. An individual female nests approximately every 3 years, and lays 1-6 clutches of between 70 and 110 eggs. The incubation period lasts 50 to 70 days. Adult green turtles are the only truly herbivorous marine turtles. They feed mainly on seagrasses or algae, mostly in the tropics and subtropics. Green turtles are particularly sought for their meat. 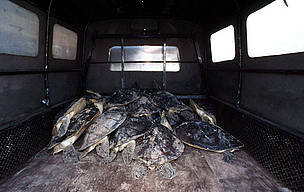 Researchers estimate that each year poachers take 30,000 green turtles in Baja California alone. 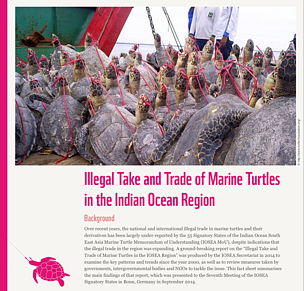 International trade in products such as green turtle calipee has exacerbated the directed take of marine turtles. 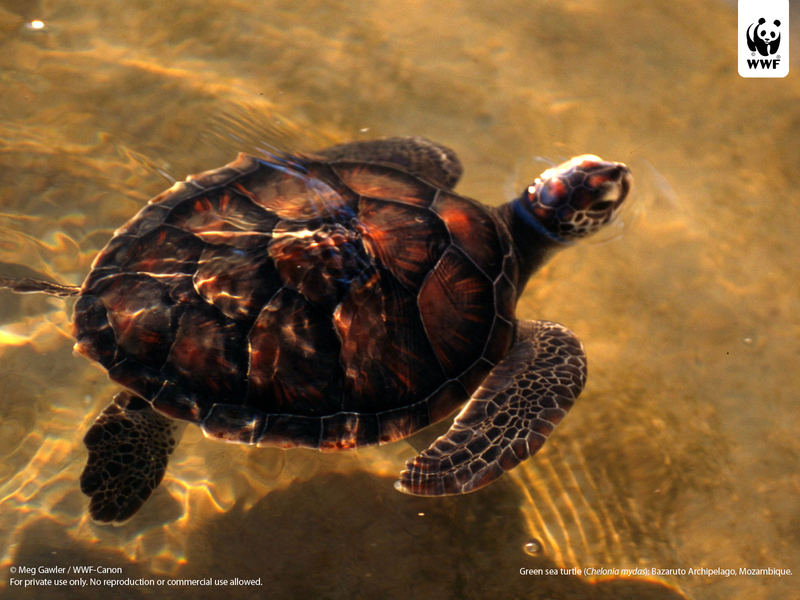 Green turtle consumption in Bali peaked in the late 1970s when more than 30,000 green turtles were landed each year. 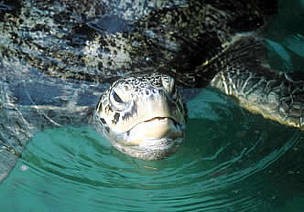 In 2002, landings were estimated at 684 green turtles per month. A further factor affecting green turtles is disease. On some of the Hawaiian Islands, almost 70% of stranded green turtles are affected by fibropapillomas, a tumorous disease that can kill marine turtles. While the cause of the tumours has not yet been discovered, a herpes-like virus that causes similar tumours has been identified in the wild. It has been suggested that the increased occurrence of fibropapillomas may be the result of run-off from land or marine pollution that may weaken the turtles immune system, rendering them more susceptible to infection by the wild herpes-like virus. Green turtles are a priority species. WWF treats priority species as one of the most ecologically, economically and/or culturally important species on our planet. And so we are working to ensure such species can live and thrive in their natural habitats. Seagrasses and algae on which green turtles feed also happen to be amongst the most productive ecosystems on the planet as well as providing a nursery for many species of invertebrates and fish. WWF works to protect marine turtles throughout the world through specialist programmes and regional projects devoted to the conservation of marine turtles. Action to address the impacts of climate change. Monitoring the migration patterns of marine turtles. Improving and supporting trade controls. Reducing bycatch and promoting smart fishing. WWF works with local communities in the Indian and Pacific Oceans to ensure that traditional or subsistence take levels are sustainable, and where necessary to identify alternative sources of income. Send a turtle to rehab! 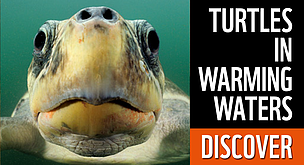 Help the recuperation process for thousands of sick and injured turtles. Don't buy sea turtle products Guitars, ashtrays, jewellry and other products made from sea turtles are sold to tourists around the world. The population found in the eastern Pacific is often called the black turtle, and is sometimes described as a separate species (Chelonia agassizi).